Whew... where did the weekend go? My Beloved and I went out for a date night on Friday. A very yummy dinner out (I had a Cajun chicken burger and salad), a meander through the bookstore, and a movie (The Intern... I highly recommend it. Very funny). Saturday was just a wasted day for me. I woke up in a foul mood and stayed that way pretty much all day. I don't know what it was, but my poor Beloved and wee-lings had to put up a very cranky hobbit all day. I had no motivation to do anything. Ok, I did cook a big breakfast (challah French toast, turkey sausage, and scrambled eggs), and I did make dinner. But other than that, I was just a lump. A grumpy lump. So by default, today was a very busy day. Sunday school, worship, trip to the bakery, grocery shopping (which SHOULD HAVE BEEN DONE ON FRIDAY), putting away of said groceries, cooking supper, and getting Ginny's stuff ready for school tomorrow (including coming up with something for Crazy Hair/Hat/Tie day). As an aside, can I just say, for what we pay for groceries, someone should bring them home for us, schlep them up the stairs, and then put them away. And I strongly dislike the grocery store on a Sunday afternoon. I don't want to be there, and it seems like everyone else in the Shire wants to be there, dawdling. I should have also gone to the Halloween supply store to look around because I know if I don't get there soon (yes, I know it's only the end of September, but they tend to get picked over quickly) Ginny and Pip will end up trick or treating as "Kids with a Pathetic Mommy Who Can't Sew and is Running Out Of Imagination For This Crap". Oh dear, I think I'm still a grumpy lump. 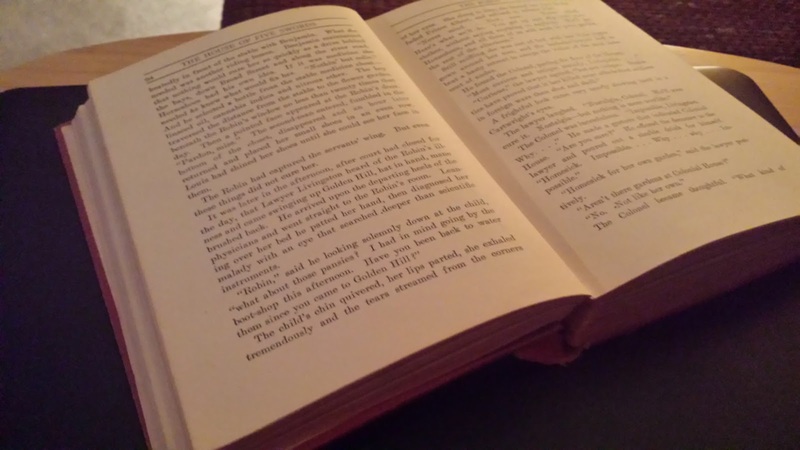 Reading - Go Set A Watchman by Harper Lee. I'm about a third of the way through it and I'm liking it, for the most part. I purposely avoided any reviews of it, but there are a few distracting things that I read about the book earlier in the summer that are taking some of the enjoyment out of it for me. That's what I get for being number 22 on the hold list at the library on the day it was released rather than buying a copy for myself. Watching - Nothing. The tv is actually off (a rarity in our house... I can hear you tsk-ing me from all around the world. Yes, I am a tv junkie), but the DVR is recording. Listening To - Right this second, New Kids On The Block. I have my headphones on because my Beloved was watching Fawlty Towers (John Cleese is a comic genius, but was grating on me tonight). 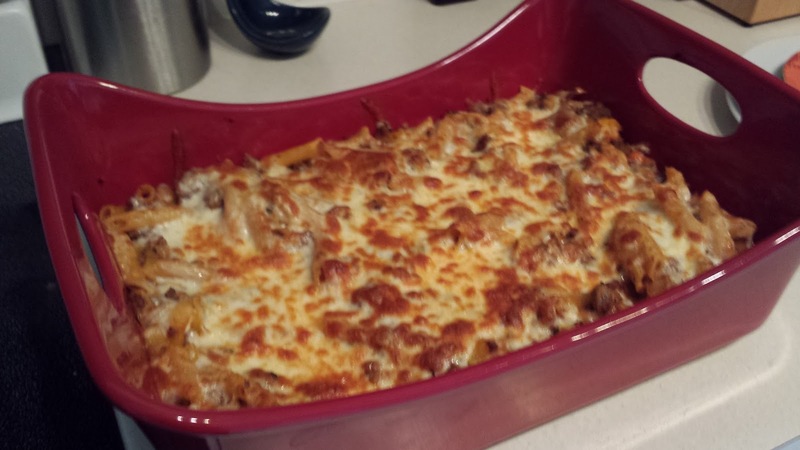 Cooking/Baking - Tonight's dinner was baked penne with meat sauce and Caesar salad. I made it specifically to initiate my new Rachael Ray Lasagna pan that my Beloved gave me for my birthday. I had been drooling over the pan for a while, and as it means that he will get more lasagna I'm sure he thought it was a win-win sort of gift. It's one of those things for the kitchen that I want, but would never just go out and buy. Tomorrow we're having chicken curry with rice and roasted green beans. And I recently realized I have about a dozen frozen black bananas in my freezer that I should turn into banana bread or muffins or something soon. Thinking About - the start up of our congregation's Confirmation classes for this year. I'm struggling with getting a couple of families to commit. They want their kids confirmed, but they also want me and the other students to work around their schedules. Kind of frustrating. Adding to My To Do List - Oy, tomorrow's to do list is already a mile long. Clean the kitchen and bath, work out (I MUST), work on my writing project, clean the fish bowl, wash towels, and hopefully clean up my dead container garden on the balcony. 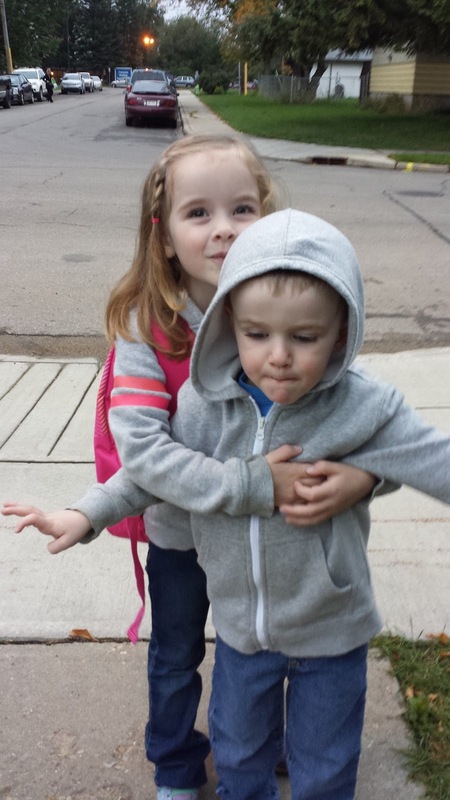 Thankful For - The fact that my Beloved and wee-lings love me even when I'm a grumpy lump... or a lumpy grump. Or just plain bitchy. Marriages around me have taken an beating in the past month. Three marriages in my broader social circle have hit the skids. One is a couple with two small kids, who had been together since high school. Another involves a stereotypical mid-life crisis. The third just makes me sad. Two are in our family, one is an old friend. All of this makes me wonder, why? And why am I surprised when it happens? I know that no one goes into marriage (except maybe a Kardashian) with the expectation that it will end. And it makes me worry... if it can happen to these people, then it could happen to us. My Beloved and I are good. We've faced a lot together and survived it. I think we've come through much of it stronger, as a couple. As a team. Current events have just rattled me a little. This was posted as a part of Mel's #MicoroblogMondays. Pop over and check out what others are sharing today. A while back I mentioned that I was reading an old favourite, The House of Five Swords by Tristram Tupper. I love this book. It's a beautiful love story set at the end of the Gilded Age, in a small Virginia town. It's a love story between a daughter and father, between a man and a woman, and between a family and their honour. A son disowned, and a mysterious stranger who shows up just as the town builds a munitions plant to capitalize on the war in Europe. I bought this book when I was 13 or 14 years old from a recycling depot in K-town, when I was obsessed with books that looked old. It's a first edition (not that I think it made it to a second printing) from 1922. I read it and fell in love. When I went to Germany as an exchange student for three months, it was one of the two English-language novels I took with me (I can't remember the other). I re-read it over and over, all the way through high school. When I left for college, I packed up all the books I wasn't taking with me (it didn't make the cut this time), and put the boxes in the garage. Four years later, when I returned and was trying to get my stuff together for my out-of-province move, I couldn't find that particular box of books. My mom thought that they may have been sold in a garage sale the year before. I was heartbroken. Over the years, I would poke around on the internet to see if anyone was selling a copy. I had seen them listed for as much as $1000 on ebay, but even at the more common price of around $200, I just could never afford to replace it. A few years ago, when my parents were downsizing, they shipped a couple of boxes of my things that had been found around their old house. Lo and behold, one of the boxes was my box of long lost books! There were several other of my 'antique' books, but right on the top was my House of Five Swords. I hadn't read it since high school, and recently I was moved to re-read it. Reading it as an adult was an amazing experience. Reliving scenes that had stayed in my mind over the years, discovering new tidbits that I hadn't resonated with as a teen. 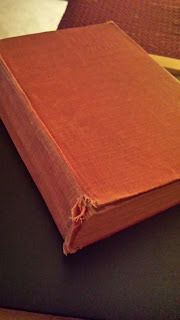 The thick paper of the pages, the fragility of the spine, the musty smell that is undeniably that old book smell. While ereaders and tablets may be convenient this book, and others like it, are why this hobbit will never fully transition away from paper books. This was posted as a part of Mel's #MicroblogMondays. Click over and check out what others are talking about tonight. 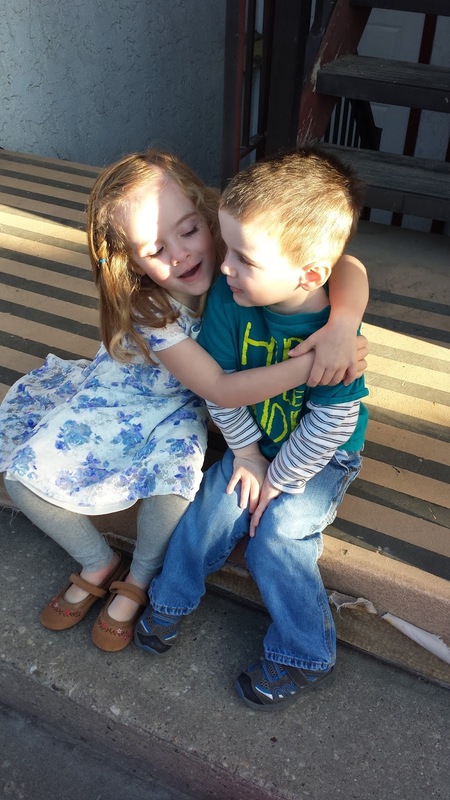 Sunday Night Chit Chat: Last Weekend of Summer? This certainly hasn't felt like Labour Day weekend around here. It's been so cold and rainy that it really feels more like Thanksgiving weekend. It's been 6C since Friday. We spent part of the day yesterday in the Teeny-tiny Town to the South, where MIL lives. She had invited us down for dinner. Now, I love my MIL. She is a very sweet, giving woman. Generous to a fault. She has, however, three little foibles... 1 - she drops by unannounced, whenever she's in town, 2 - She lives on the borderline between pack-rat and hoarder (If I get rid of something from our house, or donate them to a thrift store, I CANNOT tell her. She has, in the past, gone through my boxes and bags of thrift store donations and 'saved' more than half of it), and 3 - she eats dinner early, really early. When my FIL was alive, dinner was at 5pm sharp. Now, she eats dinner between 4 and 5pm. Yesterday, dinner was at 4:30. Crazy! 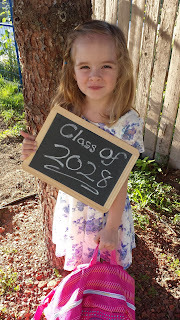 Other big happenings in the hobbit-hole this week... Ginny's first couple of days of kindergarten. 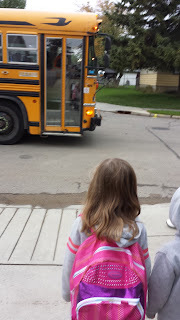 She has done really well and is super excited about things like gym class and having TWO recesses. She brought home her first home-reading assignment and has been especially keen on reading to us all the time. She is in a class of 23. Twenty-two little girls, only one boy (poor kid, lol). I'm struggling a bit with the fact that there are big chunks of her day that I have no clue about, and have to rely on what she tells me. She's not big on the details of her day just yet. Riding the bus went well on Friday, the only hiccup being that she almost forgot her hoodie on the bus when she came home. While letting go has been an adjustment (who am I kidding, I shed more than a few tears) for both my Beloved and I, the one who has been most affected by Ginny going to school is Pip. On her first day, when we left her in her classroom, it was Pippin who started bawling on the sidewalk in front of the school, crying "I miss my Awwdweee". Friday was rough on him too, particularly at nap time. He desperately wanted Ginny to come give him hugs and smooches before he went down to sleep. One other highlight of this weekend... the Roughriders finally won a game! Woohoo! An 0 and 9 record was getting a little tough to swallow. Hopefully this means bigger and better things for our Roughies! Reading - I just finished "The All-Girl Filling Station's Last Reunion" by Fannie Flagg (of Fried Green Tomatoes at the Whistlestop Café fame). It was really good, about a little piece of WWII history that I didn't know. The first couple of chapters were a bit confusing, but once I got into it, I really loved it. And an interesting main character, who finds out when she's 59 (or is she 60?) that she was adopted, and the fall out of her quest to find her birth mother. Sweet and funny. Tonight I'm starting a pot-boiler romance, "The Art of Sinning" by Sabrina Jeffries. I really do enjoy the occasional bodice-ripper. Watching - Nothing. Sportscenter is on, but I'm not really paying attention. I am, however, looking forward to many of my regular shows coming back soon. Oh, and if you live in Canada, you really should check out "Still Standing" on the CBC. It's Jonny Harris (he plays Constable Crabtree on Murdoch Mysteries, but he's also a great stand-up comic). The show is Jonny traveling to small, struggling towns across the country, and learning what makes them unique. It sounds a bit dull with how I've described it, but it really is terribly funny and very cool how he works all the local folks he meets into his stand-up routine. Listening to - My Beloved is snoring on the other end of the couch. Cooking/Baking - Tonight was a full on fall supper. Pork roast (done with steak spice, thyme, and a bit of cinnamon), mashed taters & gravy, roasted acorn squash, broccoli, and Yorkshire puddings. Yum! It was so good, and perfect for a day like today. We also had apple pie (a frozen one I found in the freezer) for dessert. On Friday, to distract Pip a bit from his missing-Ginny-funk, we baked chocolate chip cookies. Adding to my To Do List - I MUST make optometrist appointments for the wee-lings! I MUST! And I'm colouring my hair tomorrow. I'm sick of the grey. Thinking About - That I hope I can sleep past 5am tomorrow. My internal clock wakes me up at 5 almost every morning. It would be nice to sleep in a bit. Thankful For - My church family. They really do care about us, about the wee-lings, and always lend a hand in wrangling my kids' stuff that ends up everywhere during the service. Today there was some good-natured ribbing going on with the families who usually sit near us, as they are Winnipeg Blue Bomber fans (the long time rivals of the Roughriders).